MMS JUNE 2018 86 mmsonline.com 1928-2018 the 1943 article with several colleagues who commented on various ways manufacturing has advanced. Comparing the processes then and now, here is what they see: • INVENTORY. 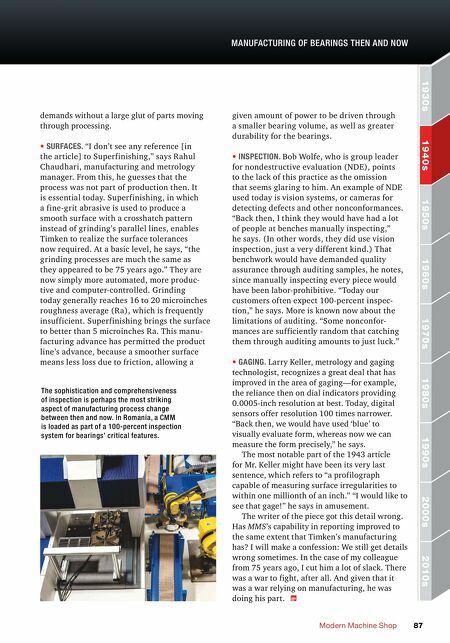 Praveen Pauskar, group leader and technologist for Timken, notes that large inven- tories of finished goods or work-in-process were apparently taken for granted back then, but now they are recognized as significant sources of cost. This recognition has influenced the choice of part- making operations, he says. 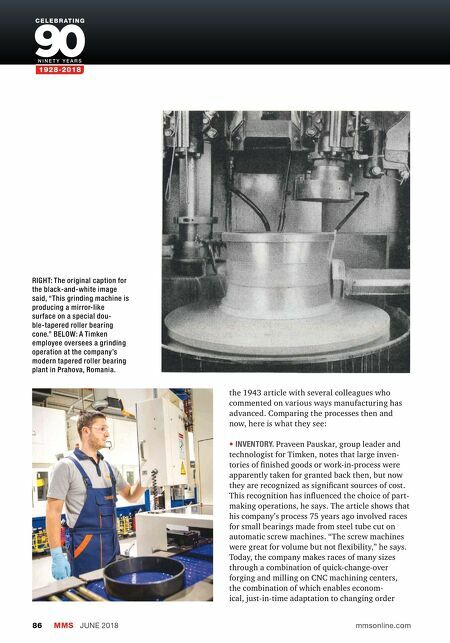 The article shows that his company's process 75 years ago involved races for small bearings made from steel tube cut on automatic screw machines. "The screw machines were great for volume but not flexibility," he says. Today, the company makes races of many sizes through a combination of quick-change-over forging and milling on CNC machining centers, the combination of which enables econom- ical, just-in-time adaptation to changing order RIGHT: The original caption for the black-and-white image said, "This grinding machine is producing a mirror-like surface on a special dou- ble-tapered roller bearing cone." BELOW: A Timken employee oversees a grinding operation at the company's modern tapered roller bearing plant in Prahova, Romania.